MEL-ROL XLT waterproofing system is a flexible, versatile, dependable, roll-type waterproofing membrane. It is composed of a nominally 56 mil thick layer of polymeric waterproofing membrane on a heavy duty, four-mil thick, cross-laminated polyethylene carrier film. The two components are laminated together under strict quality-controlled production procedures. A handy overlap guideline is printed 2 ½” (63.5 mm) in from the material edge on each side to assure proper overlap coverage and to assist in maintaining a straight application. Special exposed polymeric membrane strips are provided on both sides for positive membrane-to-membrane adhesion in the overlap area. The membrane strips are protected by a pull-off release strip. All components of the MEL-ROL XLT waterproofing system work together to provide a cost-effective, positive waterproofing system that’s quick and easy to apply. W. R. MEADOWS accessory products included in the MEL-ROL XLT waterproofing system are: BEM, MEL-ROL LIQUID MEMBRANE, MEL-PRIME™ adhesive (solvent-based and water-based), POINTING MASTIC, CATALYTIC BONDING ASPHALT, TERMINATION BAR, PROTECTION COURSE and MEL-DRAIN™ drainage board. MEL-ROL XLT waterproofing system provides a cost-effective answer to properly waterproof foundations, vertical walls, and below-grade floors in residential and commercial construction. It is equally effective for use as between-the-slab waterproofing on plaza decks, parking decks, and structural slabs. Use it as a waterproofing membrane to isolate mechanical and electronic rooms, laboratories, kitchens, and bathrooms. MEL-ROL XLT offers positive protection when “wrapped around” major rapid transit, vehicular, utility, and pedestrian tunnel projects. MEL-ROL XLT can also be used on insulated concrete forms (ICF). 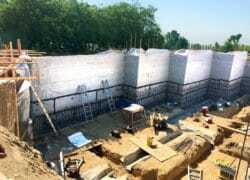 Installation of PROTECTION COURSE from W. R. MEADOWS is recommended before backfilling. MEL-ROL XLT can also be used with drainage boards when specified. MEL-ROL XLT is available in two other grades, dependent on application temperature: standard MEL-ROL and MEL-ROL LOW TEMP. A handy overlap guideline is printed 2 ½” (63.5 mm) in from the material edge on each side, assuring proper overlap coverage and assisting in maintaining a straight application. The polymeric waterproofing membrane is protected by a special, , easy-to-remove release paper. The exposed membrane strips on the material edges are protected by a pull-off release strip. Exposed polymeric membrane strips are provided on both sides of MEL-ROL for positive membrane-to-membrane membrane adhesion in the overlap area … note the detail, as shown in inset photo. Temperature … Apply in dry, fair weather when the air and surface temperatures are above 0° F (-18° C). Do not apply to frost covered concrete. REMOVE release paper from MEL-ROL XLT from the top edge of the roll and firmly press exposed area to the wall. Remove the release paper from the rolls in a downward direction, pressing MEL-ROL XLT into place on the wall. Footing Details … Use a strip of MEL-ROL XLT for impaction sheet coverage. First, fold strips lengthwise and then cut at the fold. Material is then ready to install as 4 ½” (114.3 mm) strips on either side of the rebar. Any excess can be turned down on the face of the footing. Next, fill the voids around rebars in the keyway with CATALYTIC BONDING ASPHALT. Pour the walls. Install DETAIL STRIP horizontally along the wall where it meets the footing, placing half the material up the wall and the other half onto the footing. Extend the material 4 ½” (114.3 mm) beyond outside corners. Slit extended portion of DETAIL STRIP lengthwise. Place the horizontal flap out onto the footing and bend the vertical flap around the wall. (See Diagram A.) Repeat this procedure in the opposite direction as shown in Diagram B.
MEL-ROL XLT can be applied to concrete, masonry surfaces, wood, insulated wall systems, and metal. All substrates must be clean, dry, and free of all surface irregularities. Horizontal Application … Remove release paper on edge, then position the MEL-ROL XLT membrane. Pull balance of release paper off, running the roll from low to high points, so all laps will shed water. Stagger end laps and overlap all seams at least 2 ½” (63.5 mm). Apply a double-thickness of the MEL-ROL XLT membrane over construction, control, all expansion joints and over cracks greater than 1/16″ (1.59 mm) wide. Hand-Rub and Roll Press … Once positioned, immediately hand-rub the MEL-ROL XLT membrane firmly to the surface, removing any bubbles or wrinkles, then pressure roll the complete surface to assure positive adhesion. Inside Corners … Before MEL-ROL XLT is applied, place a vertical DETAIL STRIP on inside corners extending the material 4 ½” (114.3 mm) beyond each side of the corner. (See Diagram D.) Terminate at the footing and finish the corner with POINTING MASTIC. Drains and Protrusions … All protrusions should be sealed with two layers of membrane applied at least 6″ (152.4 mm) in all directions. Seal all terminations with POINTING MASTIC. Around drains, apply two layers of MEL-ROL XLT and put a bead of POINTING MASTIC between the membrane and clamping rings and at all terminations, drains, and protrusions. See ASTM D 5898. Inspect and Repair … A thorough inspection should be made before covering and all necessary repairs made immediately. Tears and inadequate overlaps should be covered with MEL-ROL XLT … slit fish mouths and patch. Seal edges of all patches with POINTING MASTIC. Where applicable, horizontal applications can be flood-tested for 24 hours. All leaks should be marked and repaired when membrane dries. Avoid the use of products that contain tars, solvents, pitches, polysulfide polymers, or PVC materials that may come into contact with MEL-ROL XLT. The use of MEL-ROL XLT does not negate the need for relief of hydrostatic heads. A complete drain tile system should be placed around the exterior of footing and under slabs, as required. BEM … BEM can be used as a fillet to round out 90° angles, such as the wall-footing connection, and can be used as a substitute for MEL-ROL LIQUID MEMBRANE. POINTING MASTIC … Used as an adhesive and for sealing top edge terminations on DETAIL STRIP and membrane, and to adhere PROTECTION COURSE. CATALYTIC BONDING ASPHALT … Easy-to-apply, one-component material for sealing around rebar. COVERAGE: 5 gal./1000 ft.2/gal. (4.9 m2/L) PACKAGING: 5 Gallon (18.93 Liter) Pails. This material last updated December 2014.